Designed specifically for the iPhone XR, the Fisheye + Super-Wide + Macro Essential Lenses from olloclip is a manufacturer's bundle that contains a Fisheye Essential lens, which offers a 180° spherical effect, a Super-Wide Essential lens, which offers a wider field of view, and a Macro Essential lens, which offers the ability to focus up close and enhance the camera perspective of your iPhone XR. Also included is an iPhone XR clip, allowing each lens to be attached to your iPhone XR. This set is also equipped with Connect X Lens System, so you can swap with other Connect X lenses. 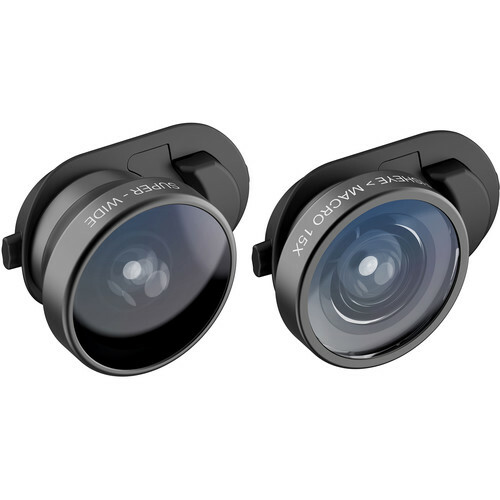 These lenses work with caseless phones or olloclip's Slim Case for iPhone XR, but will not work with other phone cases and integrated smartphone flash. Screen protectors are fine to use. This lens creates a unique, 180° spherical effect to capture everything around you. Use it from action sports videos, creative portraits, emphasizing unique architecture, or landscapes. The macro lens turns your camera into a microscope for extreme close-up shots. Use it for sharp focus on small objects with a blurry background effect, which helps to bring out fine textures and intricate details. Double your field of view and get more in the frame with the Super-Wide Essential lens. Use it for group selfies, expansive landscapes, and architecture shots. Box Dimensions (LxWxH) 5.6 x 4.4 x 1.9"